I don't know what it is. We are in desperate times certainly as countries sheer off from one another with an ear wrenching crack over the Brexit fiasco, but there is in interiors a perceptible reaction brewing against the stark and muted tones of the 50 Shades Greyer years we've all had to endure, and in its place a general warming and brightening. I've seen it. It started with bringing the outdoors in, swathes of acid green and glossy emerald green foliage in rose gold terrariums. 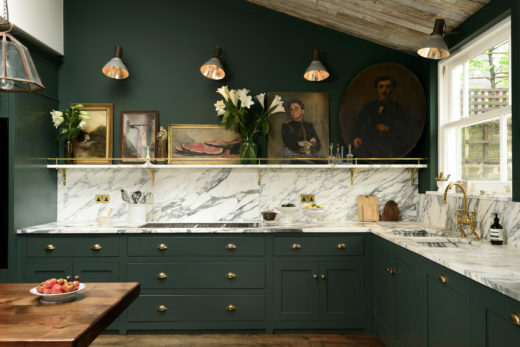 And grew louder with a desperate sort of excitement as Farrow & Ball announced the launch of the 9 new paint colours, the first in...simply ever, but yes, colour is BACK. With a big old fashioned bang. Right between the eyes people. Hurray!!! OK so let me break this down....colour IS back but (caution required) not with the sort of pop that would have you doing over the drawing room in neon pink, no this trend is in the reassuringly grounded tones of Peignoir (a divine pink grey - yup not gone yet) Mustard, Terracotta (a good version) and Malachite green. Colour is back kids, but it's definitely grown up a lot. So indulge by all means but infinite care is required, not any old colour will do. Wow! This is colour blocking on a whole new scale. Olive green plays sky blue beautifully. Even clashing tones of peach and terracotta will work - Proceed with caution. I love design. And most of the time it loves me. Phew!